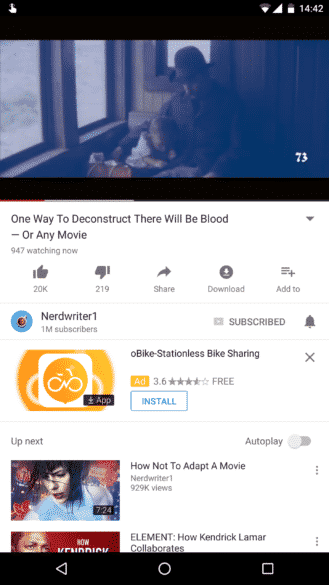 YouTube is doing a new server-side test, with select Android users. The new test tells us how many people are watching a video concurrently. There are times when you might want to gauge the performance of YouTube videos, particularly potential viral videos, right? Well, this new feature which is currently being tested does exactly that. The launch of Facebook’s own YouTube competitor just recently may have alarmed YouTube. The live watch counter is available below the video title, and above the like/dislike buttons. It basically tells you how many people are watching a video at the same time. The tool can be useful not just the for creators but the watchers as well. If you’re a creator, you can get insights on how your video is racking up hits and if you’re curious to find out how many people share the same interests as you, this tool can be useful. There’s been no news from YouTube about the global roll out of the new feature, however, it may not be very far away. But, considering the fact that users are complaining about the existing features of YouTube app, the plan to roll out a new feature instead of improving the already available features sounds a little awkward, doesn’t it? Issues like the ‘Share’ icon’s dismal performance, the absence of a dark theme, faster speed playback on mobile etc., are some features that YouTube needs to get in for its most ardent fans. Nonetheless, the world’s most popular online video platform is still working towards adding more features for its audience.